Tonight I dragged out my Meade 390 refractor and took a look at the pairing of planets Venus and Saturn in the twilight sky. With the 32mm eyepiece I was just able to fit both planets in the same field of view and got a very nice look at Venus in crescent phase –perhaps the best I've seen it– with Saturn tiny but distinct. 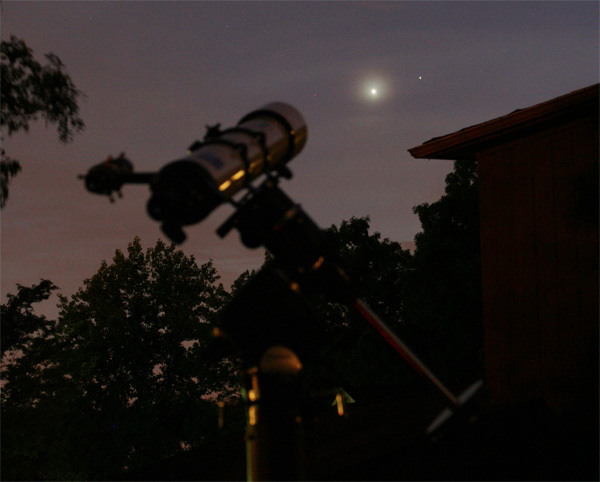 The twilight actually helped by controlling the contrast of brilliant Venus. Swung the telescope around and got a nice look at Jupiter, as well, viewed through openings between the trees here at home. Once done with the short viewing session I decided to try and imitate a wonderful photo someone else did: their telescope silhouetted against the sky with star-like Venus and Saturn visible. I took too long and lost my ambient light so all I got was what you see here. Not near as good as the other fellow's but not bad, either! It felt good to get out and experiment and learn a little more about my camera. Earlier in the day I played with attachments and got my Canon Digital Rebel XT mated to an adapter that will fit 1.25-inch telescopes! Got easy focus using the Meade 390. Now I can use the camera with the 6-inch Meade and the 9-inch scope! Can hardly wait to try it out with the Moon as subject. But that's for another night . I like this – even if you missed the ambient light. I had a trip to Grand Canyon and wanted to get the sunset etc over the canyon but we had an "idiot boy" on holidays with us and he wanted to shower before we left the hotel (no idea!!). Anyway, I was really annoyed as by the time we got there the sun had set but I took photos anyway and was quite pleasantly surprised at how they turned out. I never did get the sunset because the next day it snowed and no sun was visible!